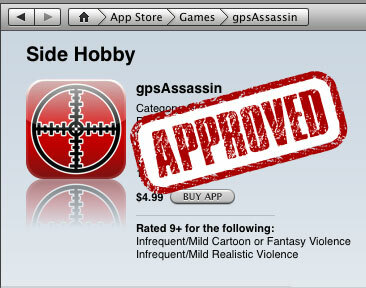 Although you guys probably heard it from Jackson Miller earlier tonight via Twitter, Apple has approved Side Hobby’s first iPhone application gpsAssassin, a location-based role playing game that lets you kill your neighbors with weapons made of words. First let me clarify the official spelling of the app so that people can (hopefully) follow suit when (hopefully) spreading the word in the future. Previously I had incorrectly listed it as GPS assassins, which again is completely wrong. You won’t find it in the app store unless you spell it gpsAssassin. I’m also going to go a step further and provide a link to the iTunes download. Sadly I’m going to refrain from speaking about the specifics of the game. This time I’m holding back because Jackson and Nicholas Holland (the other half of Side Hobby) asked me if I’d be interested in helping run a media blitz, which I of course said yes to. Now that the app is published, what I will say is there are lots of things to do over the next week. I’m so excited my head feels like it may explode [or implode… which ever is more mighty and/or awesome]. They still haven’t nailed down most of the official communication, but I’m pretty sure there will be a beta tester appreciation launch party about a week from now. Also, there are other head exploding ideas I’ve suggested and I hope end up happening. Either way check back for new developments, as I’ll be gathering the discussion on this site as it comes along. In the meantime, go to the iTunes Store’s gpsAssassin page and inflict some murderous review love if you’ve enjoyed playing the game. If you aren’t the reviewing type, then just marvel at the fishwreck screen shot (or else).